To see what is happening under our skin using light would have been a dream, as there are many strong absorbers and scatterers that act as hindrances for imaging purpose. 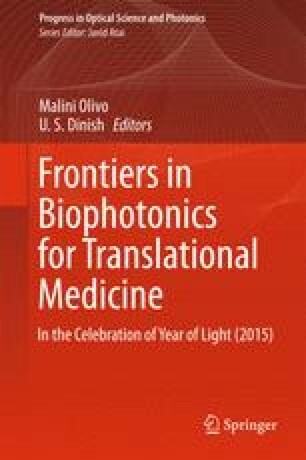 Although light penetrates the skin a little and it is possible to image and monitor superficial blood flow using light illumination, it remains as a challenge to probe deep tissue (roughly 0.1 ~ 3.0 cm) using light alone. In this chapter, we describe the challenges and recent achievements of diffuse optical methods to probe deep tissue, running the gamut from diffuse optical spectroscopy (DOS) and diffuse optical tomography (DOT) to recently developed diffuse speckle contrast analysis (DSCA). Diffuse optics has opened up a new possibility of non-invasive diagnosis of lesions in deep tissue. In addition, the usage of light makes diffuse optics-based device compatible with other conventional medical devices such as CT and MRI as well as some implanted device such as pace maker. Moreover, diffuse optics-based device is relatively cost-effective and portable. These merits could limitlessly extend its application to primary care unit, bedside monitoring, and operation theater as an optimal modality for probing hemodynamic parameters in microvasculature in deep tissue.